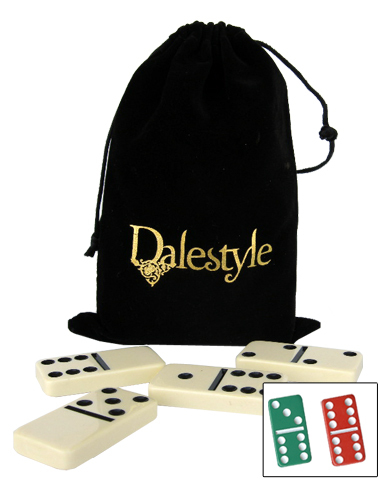 These Double Six Domino Sets in Drawstring Velvet Bags feature your one-color design imprinted on one side of the Bags. Three domino colors are available: traditional ivory with black dots, green with white dots, and red with white dots. The following Bag colors are available: Black, Burgundy, Hunter Green, Navy, Red, Royal Blue, and Silver with your choice of a Black, Metallic Gold, Metallic Silver, or White imprint. Each Drawstring Bag measures 5" wide x 7" high, and the Domino Tiles are 5/16" across x 1-15/16" high x 5/16" deep. NOTE: For this product, only the bag can be imprinted (the individual tiles cannot be imprinted). For sets with imprinted tiles, see our Domino Sets in Vinyl Cases or Domino Sets in Wooden Boxes.